My two oldest sons (third from the left and second from the right) were part of a team that recently traveled from Grayson, KY, to Del Rio, Texas and then on into Mexico for a week-long mission trip. It was Erich’s 6th or 7th trip here and Todd’s first! When this crew left our small town, their plan was to place tile on a church floor. They did what they went to do, but they also did something else! They became a family! They grew closer to God! They discovered how blessed we are in America. They learned that sharing God’s love doesn’t always have to happen in a church service. Someday, I am going to hop in that van and head to Mexico too! But for now, I will be thankful that I have children who have a desire to go, and I will do what I can to keep them living life…. Our yard is soggy. Our driveway ends with a moat! You literally have to jump across the water to get out onto the road. This morning as Olivia left for school, my friend who picks her up had to pull up sideways so that Olivia wouldn’t have to go to school with wet socks and shoes! I am so ready for a dry ground! I am so ready for sunshine……consistent, every-day sunshine! I am ready for ground that is cracked and dry! Yet, as I say that I am reminded of so many times when the ground has been just that way, and I have found myself longing for rain! Longing for moisture to help my flowers grow! So, as I begin this rainy day, I am praying for contentment. I am praying that I can see beauty in the mud puddle as a bird lands for a drink of water. I am praying that the moat at the end of my driveway will remind me of the hedge of protection I pray will guard my family from the devil’s schemes. Thank you, Lord, for rain, and forgive me for grumbling! You truly have created a perfect world! And You speak to me….. even through the rain! This is the time of year when my husband literally works from sun up to sun down. On top of his job as a professor at the university in our town, he is also on staff at our church as well as a tax preparer for nearly 50 to 60 ministers nationwide. This means that every evening as we unwind as a family, Tim sits faithfully at his desk crunching numbers and trying to help people save as much as possible on their tax return. As I thought about the word “taxed” tonight, I couldn’t help but think of the definition that refers to stress or being totally maxed out on time commitments. Feeling taxed is not pleasant! Isn’t life like this? So often God calls us to do something that seems quite “taxing.” Many times He stretches us out of our comfort zone. Mary could definitely relate to being stretched beyond comfort! If only we could see the whole picture! If only we could understand the Divine plan that we are part of! The next time you are doing something that you feel God has called you to do, and you find yourself saying, “What have I gotten myself into?” or “Why me, Lord?” Remember Mary and Joseph! They were “taxed.” Yet they fulfilled God’s plan beautifully. So beautifully, in fact, that we place their family picture on our walls or on our shelves in statue form every Christmas! The Nativity scene……..not a normal thought during tax season, but tonight as I hear Tim shuffling papers in the other room at midnight, I can’t help but smile and say, “Thank you, Lord,” for calling Tim to a life of ministry. Yes, it is taxing, but it is worth it! What have you been called to do that has stretched you out of your comfort zone? I love the verse in I Corinthians that says that “now we see but a poor reflection as in a mirror; then we shall see face to face.” It reminds me of one of those hidden-camera shows where a person thinks they are looking into a mirror only to find out that on the other side of the mirror is someone they know! The look on their face when they realize that what they thought was only a reflection turns out to be someone they know and love…………..and they are now getting a chance to see them face to face! The reunion is always full of laughter and tears. When someone you love is far away from you, phone calls and emails can be very special ways to communicate. But when you are reunited, you quickly realize that NOTHING is as wonderful as seeing someone face to face! Just imagine how great it will be on the day we meet Jesus face to face! No more need for wondering, no more need for waiting and hoping and trusting…..We will know fully, just as we are fully known! There’s another verse (James 1:23) that talks about a mirror, though, and this verse can be very challenging. “Anyone who listens to the word but does not do what it says is like a man who looks at his face in a mirror and, after looking at himself, goes away and immediately forgets what he looks like.” This verse is a warning to all of us that we must not just listen in Sunday school, take notes during sermons, study Scripture during our quiet time, and read devotionals written by other people. We must DO WHAT THE WORD SAYS! We must walk our talk. We must practice what we preach. We must be doers and not hearers only. So, another thought comes to mind when we think of mirrors. It is the thought that we must live a life devoted to God! We must remember what we hear and take it into our world and LIVE IT! We must read our daily devotions and allow them to shape us and mold us. We must study the Scripture not so we become “smarter” but because we want to become wiser. First, one day we shall see Jesus face to face and this life will fade as a mere reflection of eternity. I am praying a mirror prayer for all of my children…..and for you! If we can reflect Christ now, He will give us so much more than a reflection for eternity! What an offer! Philippians 3 seems to be the Scripture that keeps coming to my mind this evening…..
“10I want to know Christ and the power of his resurrection and the fellowship of sharing in his sufferings, becoming like him in his death, 11and so, somehow, to attain to the resurrection from the dead. 12Not that I have already obtained all this, or have already been made perfect, but I press on to take hold of that for which Christ Jesus took hold of me. 13Brothers, I do not consider myself yet to have taken hold of it. But one thing I do: Forgetting what is behind and straining toward what is ahead, 14I press on toward the goal to win the prize for which God has called me heavenward in Christ Jesus. The part in bold jumped out at me tonight when I looked up the entire passage. I kept hearing “the power of His resurrection” in my mind, and I wanted to read everything before and after this phrase just to be reminded about what all it said. When I read verse 15, I thought “wow!” As we mature in Christ, there are different expectations as to how we should view things! So I looked back to see what “things” Paul was talking about…..
First, we should long to know the power in the resurrection of Christ! Can we even grasp the power needed to raise someone from the dead? To breathe life back into someone from which the last breath has been taken. To cause blood to flow through veins that have become motionless by the ceasing of a heartbeat. Oh, to truly know this power. Second, we should want to share in His suffering. Can we ever begin to suffer in the way Christ suffered for us? To feel the whip against our back, the crown of thorns upon our head, the rejection of our friends and family, and worst of all, the feeling of separation He felt when even God turned away from Him as He hung on the cross. Third, we must realize that until the day we die we are pressing on toward the prize. Small victories may come in this earthly world, but until the day we meet God in Heaven we must treat life as a race with ONE FINAL GOAL and ONE FINAL PRIZE! The only way to do this is to stop looking backward and to simply press on toward what is ahead. I love the fact that Paul used the words “straining toward.” This implies great effort. Not looking back is hard. Not reliving mistakes, hurts, and injustices takes extreme discipline. Have you ever met someone who lives in the past? Constant blaming and excuse-making fills their conversations. Bitterness has been rooted in their hearts to the point that their past seems to control their future. I love the fact that Paul simply says it like it is: All of us who are mature should take such a view of things. In other words, if you are growing in Christ, if you study His Word and pray, if you are a Christian who considers yourself to be striving to be more and more like Him everyday, then you should expect your view of life to change day by day. Part of this change will be that you no longer look back, even when you want to. You strain toward the finish line. Maybe that’s why Lot’s wife turned into a pillar of salt. Not because she longed for what she was leaving, but because she couldn’t let go of her past. Straining forward was too difficult. It’s almost as if she was saying, “Just one more glimpse of where I was and what I was.” Don’t we all do that from time to time? Just one more feeling of regret, disappointment, rejection……just one more. Is that what God wants from us? No. Paul says very clearly, we must press on in order to win the prize. As you celebrate Easter, I pray that you will somehow grasp the power of His resurrection and that you will make a commitment to the Lord to PRESS ON………….and stop looking back….literally forgetting what is behind you. Please continue to pray for my friend who lost her mom. She is struggling to make sense of life. This morning when I woke up to start the day, I had no idea that tonight another family would be sleeping in my house grieving in the deepest way possible. As I sat with my friend earlier this evening and held her hand, she talked through her day and wondered what she could have done to make it any different. She is sleeping upstairs now with her husband. Her boys are still playing with Nick in the living room, the oldest swinging from moments of laughter to periods of questions to times of tears and the youngest spending most of the evening relishing the night of coloring eggs and playing video games almost unaware of reality. My friend’s husband has been amazing. He has held her, encouraged her, and loved her through every minute. 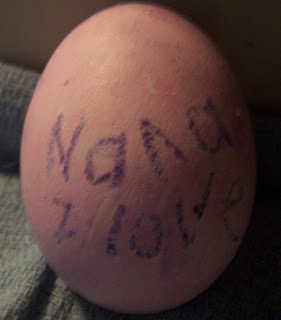 As the two boys colored their eggs, I couldn’t help but be touched by the fact that both of them individually made eggs that simply said, “Nana.” One of them even asked his mom what Nana’s favorite color was…..hearing my friend reply “I think it was purple” and then begin to cry again just broke my heart. Nana may have felt that life wasn’t worth living, but to her broken family, her life was priceless. My plea tonight to all of you is that you hug your family a little closer and that you realize how important your presence is in the lives of others even when you don’t feel that important. If God colored an Easter egg, your name would be on it. 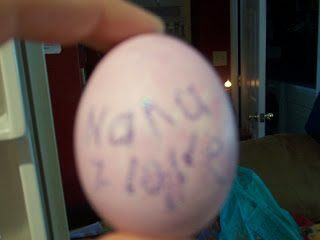 So would Nana’s! Please pray for my friend. Is that You, God, speaking through my teenage sons? Do you ever have one of those moments when you interact with your child and just as you are feeling those normal “parent emotions,” you realize that God must feel the same way about you?!?! Well, I have those moments A LOT!!!!!!!!! 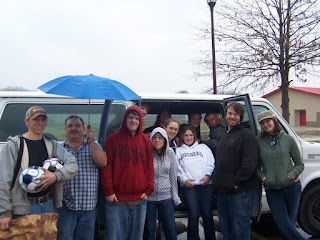 Friday, Erich was standing in the rain waiting for the van to leave for Mexico. I heard him say, “We need to stop before we get on the road….” and being the helpful, and I guess pesty, mom that I am, I hollered at Erich and told him to come hop in the van and I would run him to our house so he could do what he needed to do before starting the long trip. I noticed that it took him a minute to hear me, but it never occurred to me that He was trying to ignore my voice! When he got in the van, he informed me that “I needed to stay out of things.” He said, “We always stop, Mom. It was no big deal.” Well, I felt defeated. I just wanted to help. I waited in the van while Erich ran in the house, and when he came out I noticed he had not only grabbed a bottle of water, but he had also been given one of Nick’s tacos from Taco Bell. Erich seemed quite happy riding back over to the group preparing for their mission trip, and he did say thank you, but he never said he was sorry for being annoyed with me or that the trip to the house had actually benefitted him more than he thought it would. UGH! I was irritated. Suddenly this thought went through my head, “Tammy, Tammy, Tammy, how many times have you been unhappy with the road I have taken you on and then later realized that the road had many blessings you had never expected or asked for?” “And Tammy, how many times have you said you were sorry?” Wow! I felt humbled at that moment. Humbled that so often I expect more out of my kids than God gets out of me. Yesterday, it happened again with my son Evan. His car is broken down at college in Morehead, and he has reached a point where he is tired of car trouble. His solution is to sell his car and look for something else. However, in his mind he thinks a motorcyle makes so much more sense than a car. He argues that the gas bill would be so much less. He says that he would find other ways to bring home his dirty laundry (gee, thanks). And he assures me that he would be careful when he drove it. Sorry, Evan, but this dream won’t be coming true. Just as I long for Evan to see life from my angle, I know that God longs for me to see it from His! My prayer for you is that You will hear God speaking in the circumstances of Your day-to-day life! Enjoy the “tacos”along the way and be thankful for the times when God doesn’t immediately say “yes” to your requests. Our Father does know best!!!!! I promised a very special little girl that I would write a special note just to her and one of her best friends who check Nick’s website and my blog almost every day!!! I love you both so much!!!! I am so thankful for Christian parents who are raising up such awesome daughters! You are both AMAZING! I can’t wait to see what plans God has for both of your lives!!!!!! I know they must be awesome! Stay clost to Him, and you will succeed in whatever you do!! This morning as I was reading in Colossians the phrase “alienated from God and enemies in your minds” really made me stop and think. One of the powerful things about the book A New Earth is that it deals with your mind and thought processes. The author argues that our “ego” fights against us and that once we become aware of this battle we are somehow “enlightened.” In some ways, it is easy to buy into this argument, because I think we do fight our inner thoughts a lot in this world. The problem is this: the enemy is not our ego, it is satan. We are not being alienated from ourselves. We are being alienated from God. We are not enlightened when we become aware of this battle. We are saved when we give this battle over to God through following His steps to salvation that are clearly spelled out in Scripture. Yes, we will still face times of doubt, fear, and temptation. The difference is that we will have the Holy Spirit as our Guide. We will no longer live, but Christ will live in us! Now that renews my mind for today! As I sat here this morning having my quiet time, I decided to venture into the book of Colossians for a few weeks. Reading A New Earth (Oprah’s hot item) has really made me realize how easily humans can buy into philosophies and teachings that do not match up with Scripture. I was attracted to Colossians because when it was written there were many people who were beginning to believe very strange things (worshipping angels, etc.) in the town of Colosse and it was affecting the church. I wanted to see how Paul handled it, because I believe as Christians we need to know how to handle the strange beliefs that are coming at us from every direction in the world today. The first thing that I noticed in Colossians was that the church was known for their faith and love. Of all the things I want to be known for, those two things seem the most important to me….faith and love. Then I had to ask myself “How do I show love to others?” That’s sometimes a tough question to answer. With all of the needs within my family, I often don’t make time to really be “out there” showing love. I want to really grow in that area. The truth is, though, right now my family needs my love more than anyone else. So, for today, I am declaring that my love for my family be evident and active……. My typical Tuesday is going to be foremost full of love……..with love comes kindness, gentleness, patience, and the list goes on and on. I Corinthians 13 is a great chapter to read if you’re wondering how to show love. I hope you have a day where you are known, especially to your family, by your love!